As clean beauty products become more mainstream, in my option, the formulas have gotten much better. I say that because you want to pay for products that actually perform as they are suppose to. I made a recent visit to Sephora and I purchased some great skin care products, with the exception of one, that I actually had samples of (thanks Sephora) and tested before I decided they would be worth the purchase. Moon Juice Beauty Shroom Plumping Jelly Serum made it's debut about a month or so ago and I was dying to get my hands on it. But as I mentioned, I got samples at Sephora before I went all in. Anyway, this serum surprised me a texture surprised me a bit because the viscous texture really is jelly-like. It almost has a slightly sticky (not in a bad way) consistency where once you apply it, it's not going to run and it gives you a chance to work into the skin. 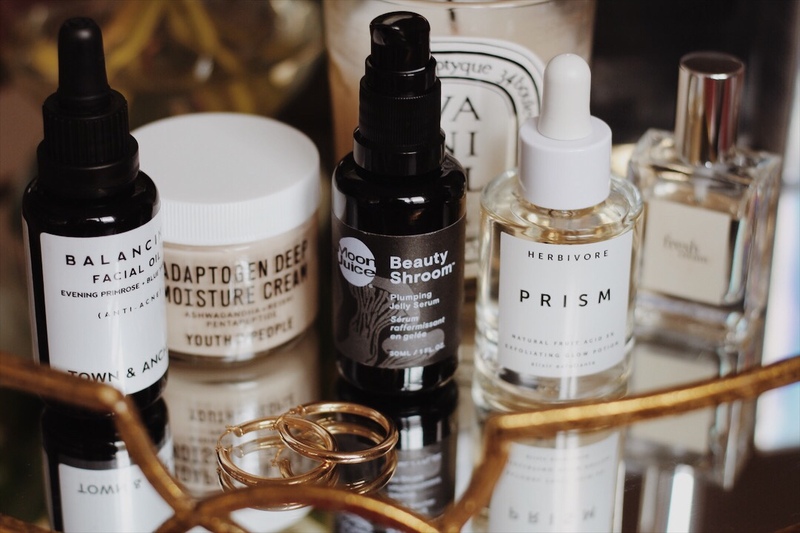 According to Moon Juice, the Shroom Plumping Jelly Serum is suppose to "fill, lift, and plump your skin" that penetrates the skin deeply and you will visibly see fine lines and wrinkles lessen with consistent use. This is a highly hydrating serum. I used this serum day and night and it looks absolutely gorgeous under my makeup. One of the best benefits of this serum is not only can you use it on your face and neck, you can use it on your lips to pump in loads of moisture! One of the beneficial ingredients is the Ganoderma Lucidum (Reishi Mushroom) Extract. It is an anti-inflammaging supermushroom. Not only does it guard against inflammation, the mushroom also boosts cell turnover. All pluses in my book! Youth To The People Adaptogen Deep Moisture Cream is also new and it dropped around the same time as the Moon Juice Serum. It's a nice smooth moisturizer that utilizes as it states in the name, adaptogens. The main ingredients are Ashwagandha, Rhodiola, Reishi, and Holy Basil. They are blended to provide super moisture and to calm skin. But here's the weird thing, when I've visited Sephora, they bill this product for oily/combination skin. When I visit the YTTP website, it's marketed towards someone with drier skin. As someone with oily skin, I've been using it with no problem. The Adaptogen Deep Moisture Cream is a light cream and I've actually used this after the Moon Juice Shroom Plumping Jelly Serum and it's a great combination for hydrating skin care. 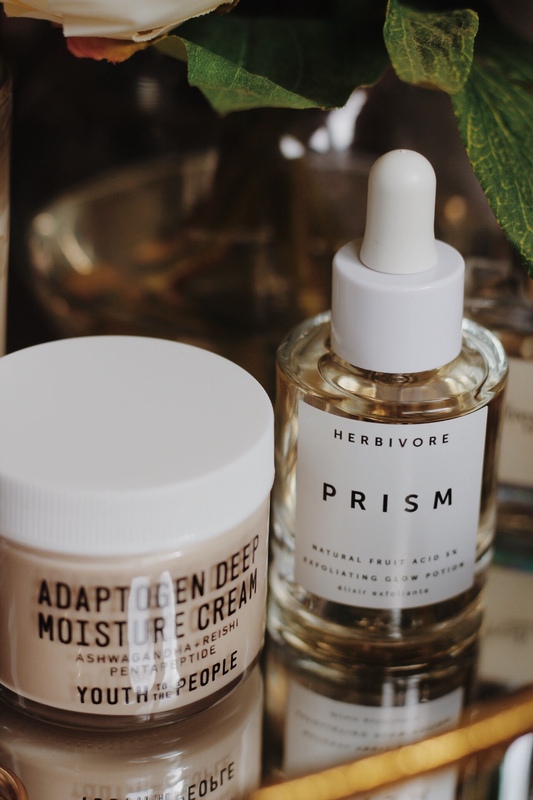 Another new serum I just had to have is the new Herbivore PRISM Exfoliating Glow Potion. I'm all about exfoliating products and this is a new addition to my arsenal of exfoliating skin care products. It's a very light serum that's described as a 5% fruit based exfoliant. It's great for brightening the skin and it hydrates at the same time. I didn't try samples of the product and I just bought it because I was curious about it, so the jury is out for me as to if this really does what it says. But I do love the light texture and looking forward to some positive results. Lastly, I bought a new facial oil from a brand called Town and Anchor. 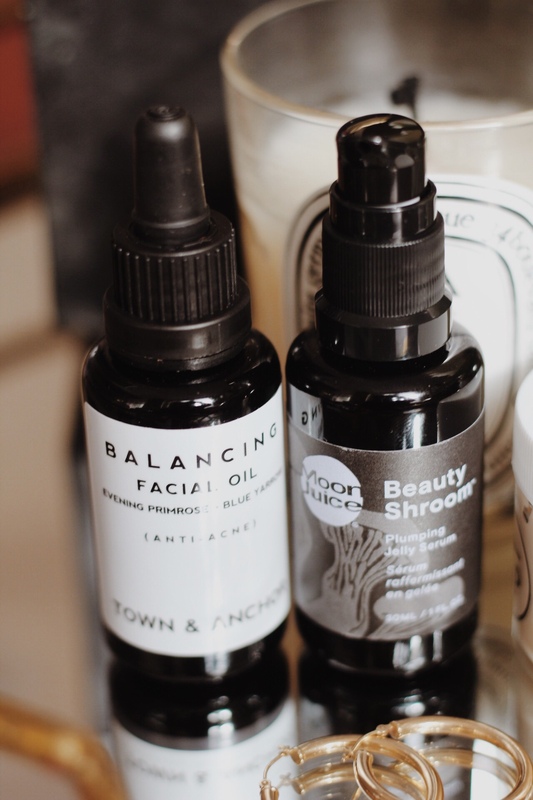 I saw the brand on Instagram and decided to try the Balancing (Anti-Acne) Facial Oil. At a great price point, this oil is indeed calming and it does help balance any breakouts that I've encountered. It's an oil that I use a night and with one to two drops, I press it into my skin after a moisturizer and wake up with gorgeous skin! This is a product I would repurchase again.